One hundred years ago this week, a handover of industry occurred. Alderman R H Beamish acquired Dunn’s Tannery in Blackpool. He intended not only to revive the leather manufacture there, but to develop and extend it. At one time the tanning industry give employment to hundreds of hands in Cork, and the leather manufactured not only acquired a high reputation through Ireland, but found its entry into Great Britain and the Continent. In 1917 thousands of cattle were killed for their hides in the city and the districts surrounding it. The hides were exported, while tons upon tons of leather were imported. Critics, quoted in the Cork Examiner in 1917, highlighted that there were no economic advantages in sending away hides to be tanned and bringing them back again to be manufactured into boots and shoes, or what was happening to a large extent, importing the boots and shoes. They expressed that was no adequate reason why Cork should not turn out material for all classes of footwear. Eighty-two years previously in 1835, records of industrial enterprises reveal that there were possibly forty-six tan yards in various parts of the city, the most extensive being located in the North Gate Bridge vicinity where there were 615 tanners in constant employment. The average number of hides tanned annually amounted to 110,000 and from 1835 onwards tanners found it necessary to import hides from as far afield as Montevideo and Gibraltar in order to supplement local supplies. Richard Griffith’s Valuation of land in 1852 lists twenty-one tanneries in the Blackpool area. However, by the late nineteenth century, owing to a series of causes, this once flourishing industry declined, and many of the old tanneries were closed down. By the turn of the twentieth century only a handful of tanneries remained in production. 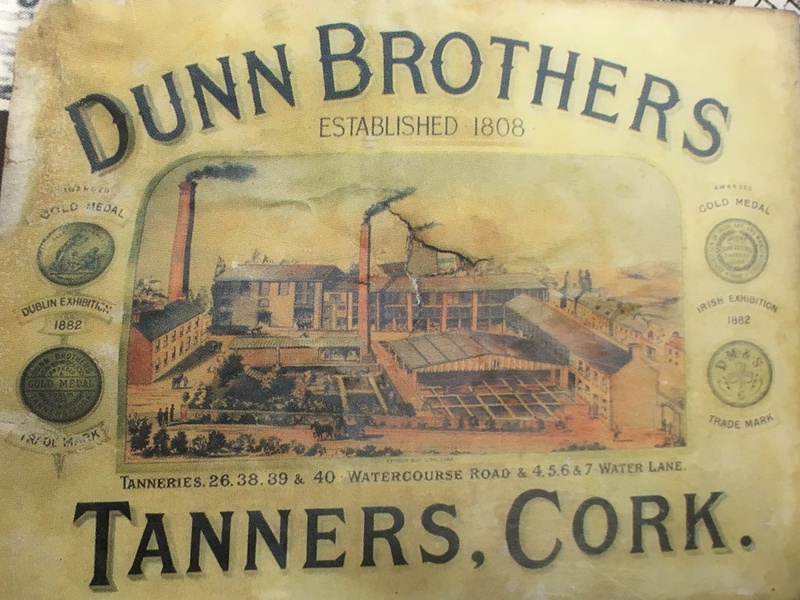 The principal tannery in nineteenth and early twentieth century Cork was Dunn’s at 26 and 38-40 Watercourse Road. It had been founded in 1808 by Patrick Dunn at Clarence Street (now Gerald Griffin Street) and moved to above in 1810. Another one of the most extensive tanyards in Cork belonged to Daniel, fourth son of Jeremiah Murphy. A partnership formed with the firm of Dunn Brothers who amalgamated their business and what emerged became the largest tanning concern in the country at the time. At the 1883 Cork Exhibition, the newspaper coverage on the exhibits refers to Dunn’s leather butts as long having been the standard article of sole leather in the South of Ireland. All the hides used by Messrs Dunn were obtained from the River Plate in South America, where the thickest hides in the world were produced. Messrs Dunn rounded the greater portion of their hides, i.e. they cut off the inferior portions, which when tanned were called offal, and when only limed and dried were called glue pieces, and these were used by paper manufacturers in sizing their paper. In 1892, in a guide by authors Stratten and Stratten of the leading mercantile houses and commercial enterprises, they described the Dunn Tannery in Watercourse Road as a “large and well-constructed hollow square covering about two acres. The centre formed the tan pits, around which group the various drying sheds workshops, stores, leather warehouses and offices. The various works were laid out on a very extensive scale and were complete with the latest machinery of the day”. The Dunn Brothers’ great speciality were still sole leather in butts and bends. They purchased exclusively the best South American hides, and employed only the most effective and highly-reputed astringents, such as bark and valonia. Stratten and Stratten remarked: “The firm has a substantial right to the high reputation and eminent position it has so long enjoyed in the commerce and industry of the country”. Messrs Dunn Brothers continued to turn out a class of leather for which there was a good demand, but their business closed down some time before the death of Mr Christopher J Dunn in November 1916. Christopher Dunn had been identified with the commercial and industrial life of Cork for very many years and was chiefly concerned in the tanning business. He was a director of the Cork Steam Packet Company, and from time to time acted on the public boards of the city. He was educated at Clongowes, was President at one time of the Cork Incorporated Chamber of Commerce and Shipping, President of the Literary and Scientific Society, was elected Governor of the Munster Institute in 1907, and was Vice-chairman of the machinery section of the Cork International Exhibition of 1902. He was a member of the City Magisterial Bench, the Cork Butter Market Trustees, the directorate of the Cork Gas Company, and Messrs. Eustace and Co. He was also High Sheriff of Cork at one time, and a member of the Governing Body of the University College since 1910. He was the author of a work entitled Machinery and the Masses and on many occasions contributed papers and essays on industrial matters. As a mark of respect to his memory the flags in the harbour were hung at half-mast. 917a. Advertisement for Dunn’s Tannery, Watercourse Road, late nineteenth century (source: Cork City Library). 917b. 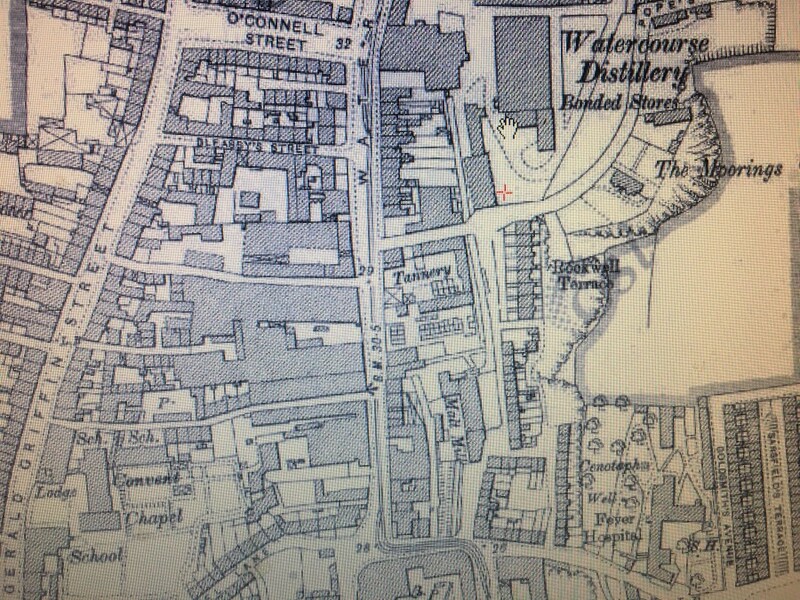 Section of Ordnance Survey Map of Watercourse Road, c.1900 showing the Dunn’s Tannery and Watercourse Distillery; some of these which was excavated during the construction of the Blackpool Bypass. For more information check out the edited book in Cork City Library, Old Blackpool, A Historic Cork Suburb (2006) by M Hurley, G Johnson & C Brett.